Crazyhouse (also known as Drop chess, Mad chess, Reinforcement chess, Turnabout chess and Schizo-chess) is a chess variant similar to bughouse chess, but with only two players. It effectively incorporates a rule from the game shogi, in which a player can introduce a captured piece back to the chessboard as his own. All the rules and conventions of standard chess apply, with the addition of drops, as explained below. A captured piece reverses color and goes to the capturing player's reserve or pocket. At any time, instead of making a move with a piece on the board, a player can drop a piece from his reserve onto an empty square on the board. For example, a check that would result in checkmate in standard chess can be answered in Crazyhouse, if the defender can play a legal drop that blocks the check. Drops resulting in immediate checkmate are permitted. Unlike in shogi, this includes pawn drops. Pawns may not be dropped on the players' 1st or 8th ranks. Promoted but captured pawns are dropped as pawns. An extension to the standard chess notation is used to record drops. Drops are notated by the piece type, followed by an @ symbol, then the destination square. For example, P@d5 means "pawn is dropped on d5 from reserve". Crazyhouse, which has been analysed much less than standard chess, requires different strategy. Pawns and knights increase in relative importance in Crazyhouse, while rooks, queens, and bishops decrease in relative importance. 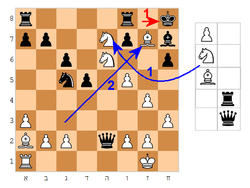 If a king is put in check by any of the latter three pieces, from two or more squares away, dropping a pawn next to the king becomes defensively useful. A knight, on the other hand, cannot be blocked by anything and its offensive value is more manifest. That piece can be used effectively to maintain a strategic influence over a region. After an early exchange of queens, it is usually unwise to reintroduce the queen too soon, particularly if she can be harassed by dropped minor pieces. Careful preparation is needed in order to reintroduce the queen to maximum effect. Pawns could be dropped deep in the enemy position where, for example, they can fork pieces or give an uncomfortable check. Minor variations of the rules have resulted in some variants. Loop Chess: promoted pawns keep their rank when captured. Chessgi (also known as Mad Mate or Neo Chess): promoted pawns keep their rank when captured. Pawns may be dropped on the 1st rank.